It LOOKS normal enough. . . Single sided deafness (SSD), losing all hearing in one ear while still having normal hearing in the other, is a bit odd. At first, I didn’t notice it or even believe it. But then again, I had just come out of brain surgery, pain was stunning, and my head was wrapped in gauze. Hearing wasn’t at the top of the list of things to worry about. When I did start to focus on it, there still didn’t seem to be any difference. I was in a private hospital room and could hear anything that was said in the room. No problem, I thought – I’ve got this. Then I started to notice little things. If I laid my head on my pillow with my good ear down, it was very quiet except for the sound of my heartbeat. That was actually kind of a good thing. I always sleep great with my good ear down. Noisy hotel room? No problem – left ear to pillow! As I recovered and found myself in noisy settings, I quickly learned what the issues are. . .
– I have to mute the television if I want to talk to someone in the room. – If I’m driving, it’s a challenge to hear my passenger talking. 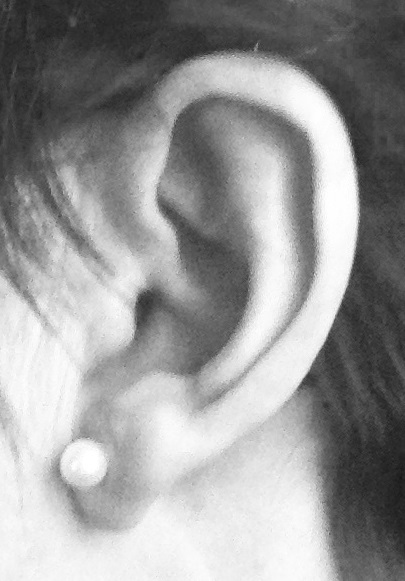 My good ear is toward the window and road noise, my deaf ear is pointed right at the talker. Listening to the radio and talking in the car isn’t even an option if I want to understand anything. – In a store one day, I heard someone far away asking someone if they needed help. Then I realized that it was a sales person standing right next to me talking into my deaf ear. – Think about this a bit but When people hug hello or goodbye, it’s generally with their head to the right of my head. Whispering something into my ear, like “Good to see you”, or “Let’s do it again” is lost on me. My nephew asked once to be reminded of my deaf side so he would be able to whisper his Christmas wish into the ear that would hear it. – At a restaurant, I’ve learned that background noise is an issue. I can’t hear the server taking my order but I can tell you that the person on the other side of the restaurant was talking about their weekend. The brain loses its ability to differentiate background and foreground noise like it does with two sided hearing. Not sure why. For awhile, I decided to barrel past it. When servers asked me a question I didn’t hear, I pretended that I knew what he/she was asking. However, I learned that it didn’t really work because I would answer the wrong question, causing more awkwardness than if I just ask for a repeat. – I let someone else step up to a hostess in a restaurant to ask for a table. – My family and friends know, so when in restaurants or stores they simply answer the question for me. It’s surprising how many times I don’t even know I am being spoken to. I’m ok with help and appreciate it. – I’ve learned to just tell people, “Sorry, I’m deaf on that side. Could you repeat what you said?” It generates some alarm in their eyes. They are embarrassed or apologetic. Sometimes I’m not sure if it’s for me or them. I am no longer awkward about it. I just laugh it off and have learned that it’s ok. I realize that in some ways, being SSD has allowed me to be less of a control freak, and let others handle little things that I don’t really need to! Learning to let go, laugh a bit, and not allow it to be MY awkward issue has helped immensely. This entry was posted in Random Tidbits and tagged acoustic neuroma, brain surgery, brain tumor, recovery, single-sided deafness, smiling again, surgery recovery on January 3, 2014 by sallystap. I have SSD for AN tumor removal 13 years ago. I also can’t hear very well or hear tones nor can I tell which direction noises are coming from. I get off balance easily, taking medication effect me more now, I get dizziness real easy. Probably the most annoying thing is when I move my head quickly my vision is blurred. I also still have tendentious and it get louder as noise levels increase.